Chief Minister Kalikho Pul today reiterated the need to develop close friendship and cooperation between Bhutan and Arunachal. He said this during his meeting with Mr Jaideep Sarkar, Ambassador to Bhutan here at Chief Minister’s Office. The Chief Minister said Arunachal and Bhutan share more than just a border – we also share cultural and religious histories, particularly the communities living in Tawang and West Kameng. He emphasized on developing the historical, cultural and trade links between the two regions by establishing border trade centres. 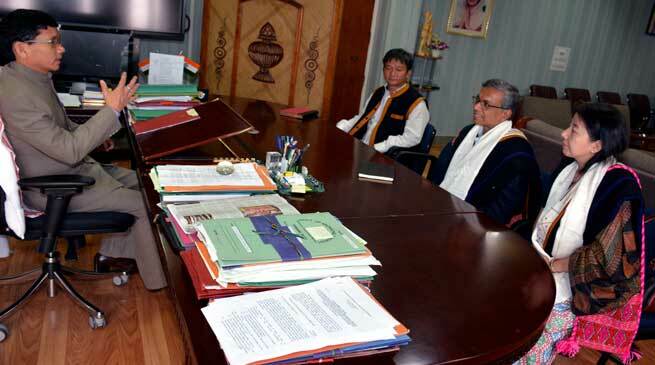 For that to achieve, the Chief Minister stressed on building direct road connectivity from Tawang to Bhutan, which will also provide the shortest connectivity to Guwahati via the Darranga land custom station in Nalbari district in Assam. He hoped that the development of this route would enable agriculture and horticulture export from Lumla sub-division along with the newly created Bongkhar circle headquarters. The Chief Minister pointed out that the opening of the road from Tawang to Darranga via Tashigaon in Bhutan would byepass the Sela pass – that often gets blocked due to heavy snow cover during winter and landslides in summer, cutting the travelling time to Guwahati by almost six hours. Appreciating the success story of hydropower and tourism development in Bhutan, he stressed on initiative for study tour between the two regions to learn the process of planning and execution adopted in the country. The Ambassador, who had called on the Chief Minister, said that the embassy in Bhutan was ready to host delegates from Arunachal coming for study tour.